Superannuation, like a trip to the dentist, isn’t something young Aussie women or men think about with great joy. The generation Y mindset is focused on current consumption – cars, TV’s, nightclubs, Fiji Holidays, Beyonce concerts or Louis Vuitton specials. Long term retirement planning doesn’t enter the decision-making calculus of the average 20-30 year old and this will only become an issue when they leave the ego-phase of their twenties and enter the more forward-thinking days of their thirties. Instead of waiting for this to happen, why not change the mindset now? Unfortunately, however, this is a far bigger culture change than one blog has the power to change and trading off the future for the now has one seriously bad outcome. Like, seriously. Australians are not saving enough for retirement and many are facing the prospect of old age poverty. This is happening at a time when Governments worldwide, including Australia are increasingly unable to provide for the gray brigade thanks to the increasing aging population dynamics. The recent changes to pension entitlements from Tony Abbott’s motley crew of neo-conservatives aren’t likely to be the last. Sadly though, the retirement saving crisis is especially bad for women (sorry ladies). 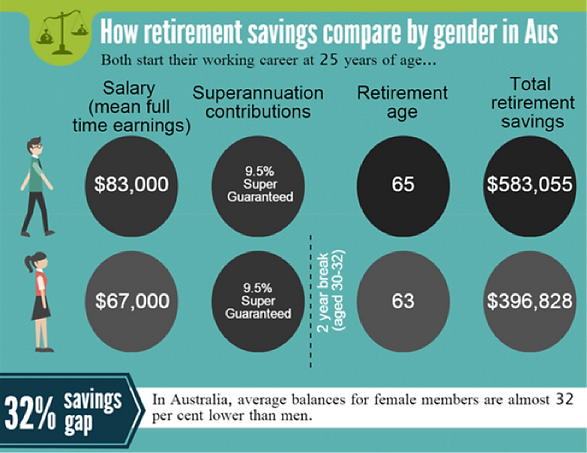 As shown in the below infographic from ANZ Bank, the savings gap between males and females in Australia at retirement is a massive 32%! Firstly, Australian women earn 17% less on average than men, which means superannuation contributions are lower. Secondly, women have career breaks to have children. Fact. And this puts them at a major disadvantage to men when it comes to long-term wealth accumulation. Seem depressing? Unfortunately, the problem is actually worse than you might think. Super is actually more important for Australian women since they live for four years longer! Well, you could do but you may get frustrated trying to translate Neanderthal into English for your Mum when she visits. Sadly the sugar will also probably run out after he gets sacked for previously undisclosed anti-social activities. Option 3: Sell the Toyota Yaris, Gucci handbag collection and fly to the US to become the next Iggy Azalea. Great strategy in theory but since 1971 only Olivia Newton John, Iggy and Helen Reddy have made number no.1 on the Billboard charts in the US. The chances of becoming a wealthy muso are, to put it lightly, pretty bloody remote. How can women give their super a boost? The good news is there are some basic steps that Women can do to boost your retirement nest egg. 1. Contribute more while you can…..
One way to address the lack of savings is to increase your super contributions before you start to have children and are out of the workforce. At the risk of sounding crude, this has the same effect as preloading on Barcadi Breezers before going out. You need end up completely loaded at the end of the night in the most cost effective way possible. Picking up what I’m putting down? Many Australians have a multiple super accounts (guilty), which means their money is eroded by multiple sets of fees. Putting all your super into one place or account prevents this from happening. The ATO super seeker service is a great tool where you can find any lost super you many have. Hop to it! Do you have a partner? The next time he receives a bonus or a lump sum inheritance, get (or kindly ask) him to make a contribution into your account. This can be a particularly effective strategy in more ways than one. If you are a stay at home Mum and earn less than $13,800, your partner may be eligible for a tax offset of up to $540. Many young Australia women and men pay little attention in choosing an investment option suitable for their needs. As a result they may not be invested in the right mix of shares, bonds cash and property (reminder: check out FFT’s last blog for more info on the right mix). Choosing the right option is extremely important to achieve your long-term retirement savings goals but it can be tricky. As I once wrote in one of my previous employer’s communications: “Making the right investment choice is a classic goldilocks problem – meaning you don’t want it too cold or too hot. To avoid the anguish of consuming something that is too cold or hot at breakfast time you need to find a serving temperature that suits your own taste buds. To work out what investment option is suitable for you, your current superannuation provider may provide a questionnaire that helps you discover your attitude to investment risk. Disclaimer: The information contained in this article is of a general nature, and it does not constitute legal, taxation or personal financial advice. In providing this information, I have not taken into account your investment objectives, financial situation or needs.